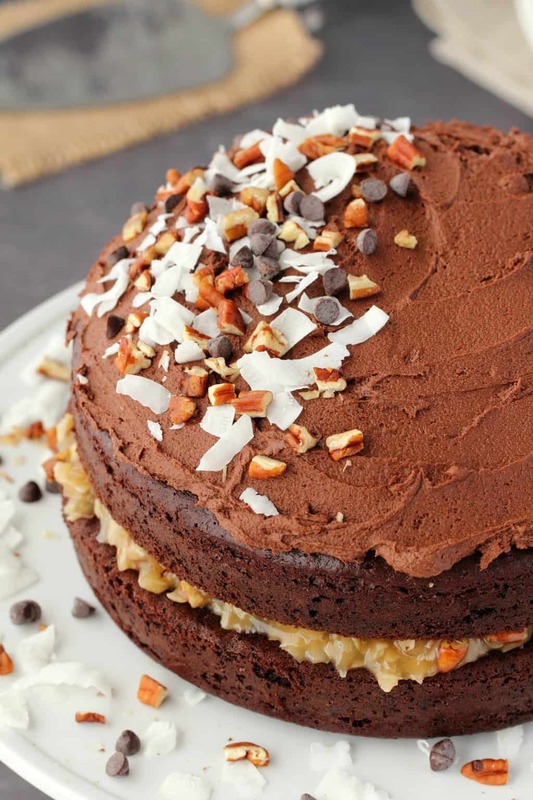 Oooh yum, this vegan German chocolate cake is two layers of delicious vegan chocolate cake with a coconut pecan filling and a rich chocolate buttercream frosting on top! 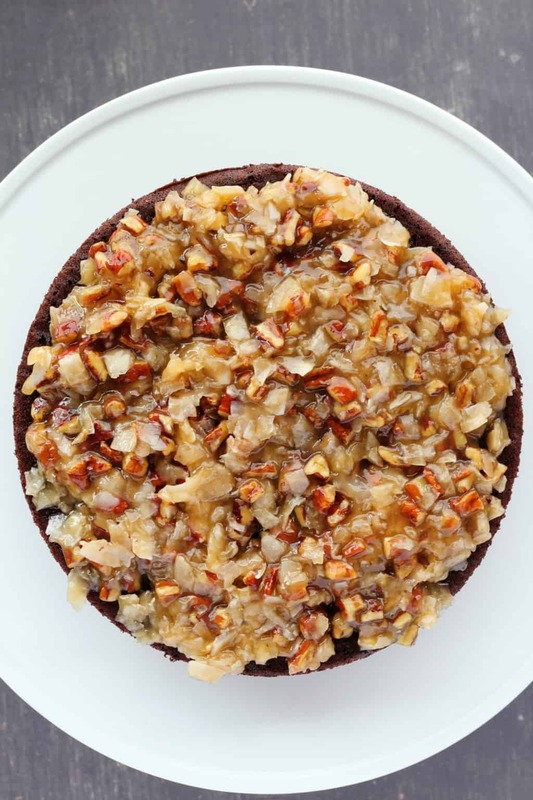 Traditionally a German chocolate cake uses sweet German chocolate in the cake itself, and then the filling is made with egg yolks, so of course we are straying from the traditional here with our vegan adaptation but the result is so good I don’t think anyone would complain! 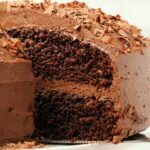 The 2-layer vegan chocolate cake is adapted from our vegan chocolate cake recipe, our original recipe is made in 7 inch cake pans whereas this cake is made in 8 inch cake pans. In fact as you can see the cake layers are so nice and fat I actually ‘think’ it would be totally fine in 9 inch cake pans too (I have not tested this though I must admit!). 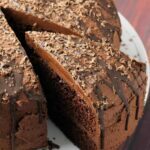 The cake recipe is super simple and straightforward, no fancy ingredients, but it results in pure chocolate cake perfection, moist and spongey and a total delight in taste and texture. 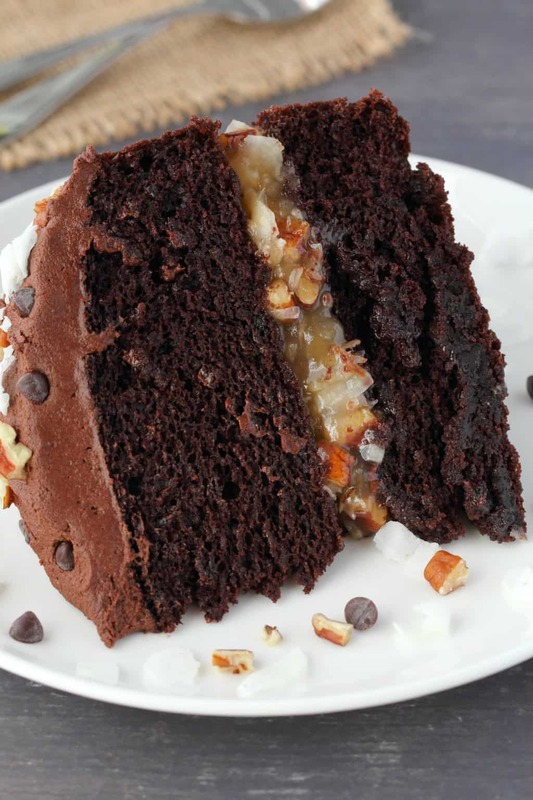 But the main attraction in a German chocolate cake is the coconut pecan filling! It’s really the stand out feature of this cake and what makes it unique and special. It’s a mix of vegan butter, brown sugar, coconut milk, coconut flakes (or shredded coconut) and pecans! You can use roasted pecans or raw. I was planning to use roasted pecans but was only able to get raw pecans when making this cake, and I wasn’t in the mood to roast them first, so I just used them as they were and it was totally delicious. So use whichever version you prefer or is easier to get hold of. Same thing for the coconut, I used coconut flakes, which are the quite large flakes of coconut you can see below, but you can also use shredded coconut, which is the slightly smaller version, just don’t use dessicated coconut because that won’t work well here. 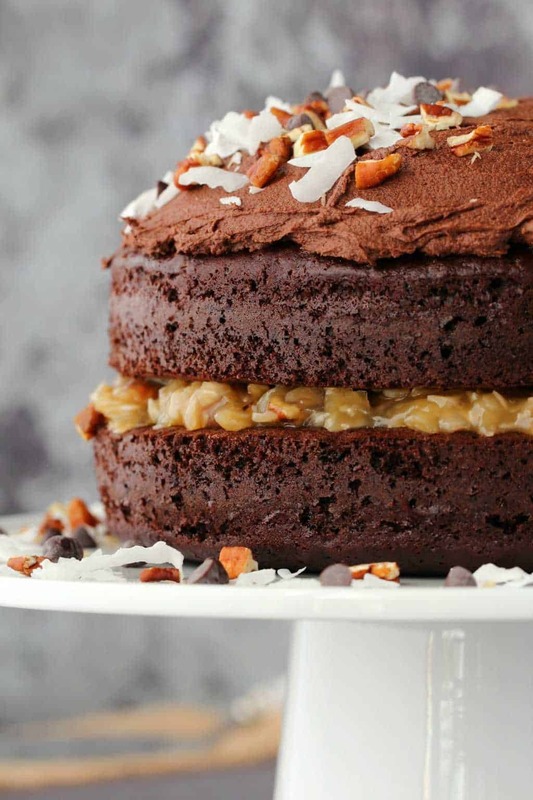 The gorgeous coconut pecan mix goes in the middle of this vegan German chocolate cake, and a delicious chocolate buttercream frosting goes on the top. I made enough for a very thick layer of frosting on top, so I’m pretty sure if you want to frost the sides as well, you’ll have enough frosting to do so without increasing the recipe. I was a fan of keeping the sides bare so you can show off that lovely coconut pecan layer. 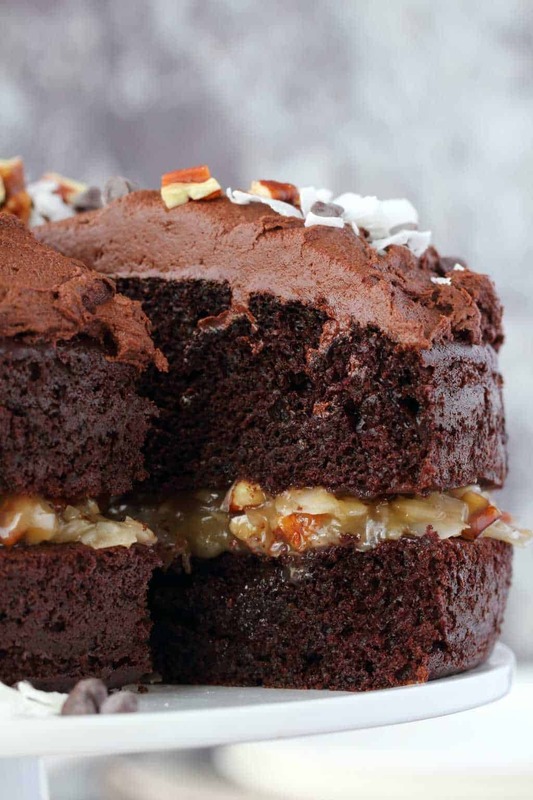 All the chocolate flavor you can dream of combined with coconut/pecan filling! It’s too good! Keep leftovers covered in the fridge where they will stay good for 5 days. 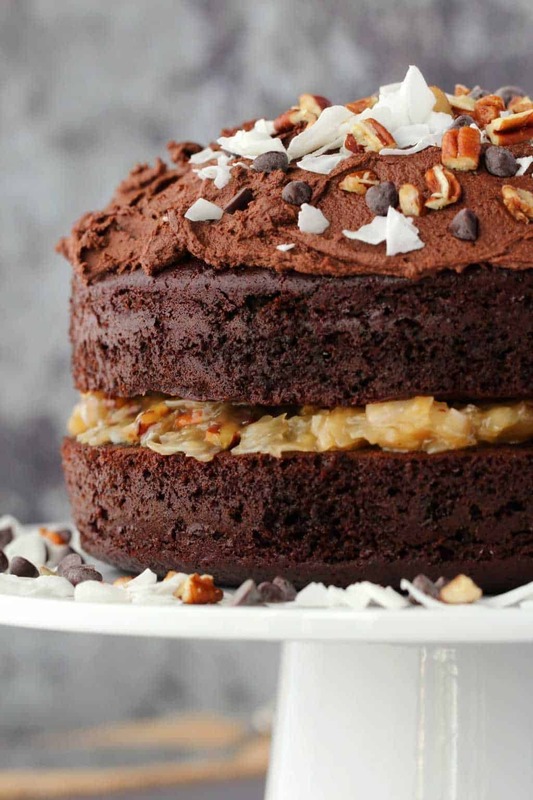 So let us know what you think of this vegan German chocolate cake in the comments and please rate the recipe too! Sign up to our email list for a fabulous vegan dinner recipes ebook containing 10 gorgeous recipes and to stay updated with all our latest recipes posted to the blog. 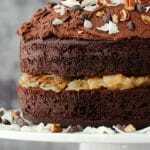 Moist and rich 2-layer vegan German chocolate cake with a coconut pecan filling and a chocolate buttercream frosting. Mega-chocolatey and ultimately delicious! Preheat the oven to 350°F (180°C). Spray two 8 inch cake pans with non-stick spray and line the bottoms with circles of parchment paper. Set aside. Prepare your flax egg by adding 1 and 1/2 Tbsp ground flaxseed meal to a bowl and then adding in 4 and 1/2 Tbsp hot water (this equals 1 and 1/2 flax eggs). Leave it to sit for a minute and become gloopy. Add in the soy milk, vanilla extract, oil, vinegar and flax eggs to your dry ingredients and mix in. Use a hand whisk to briefly mix it all together removing any lumps (tiny lumps are fine) but being careful not to overmix. Divide the batter evenly between the two cake pans and then place into the oven to bake for 30 minutes or until a toothpick inserted into the center of one of the cakes comes out clean. 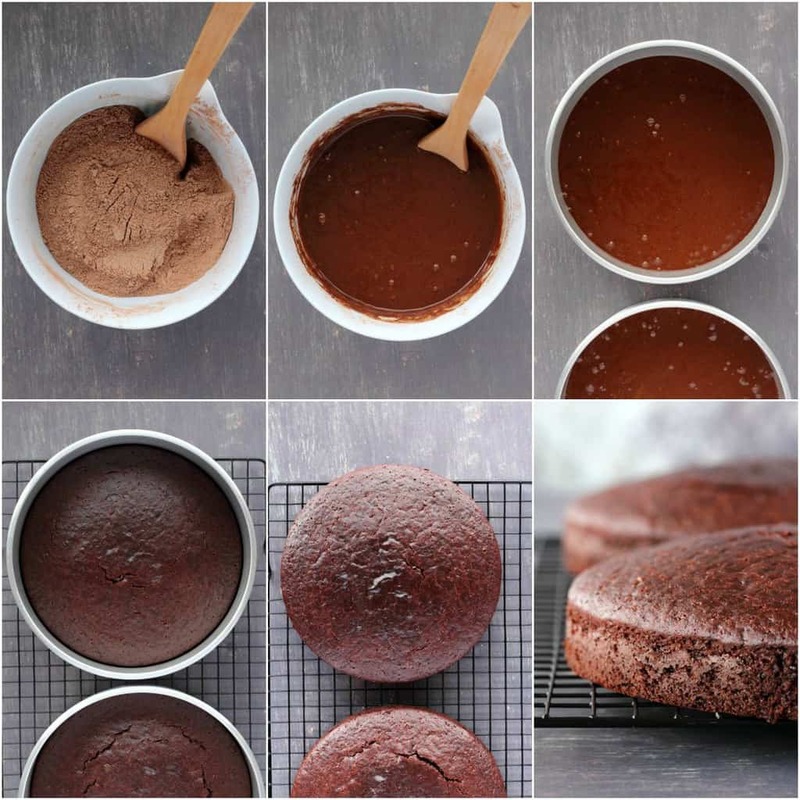 Transfer the cakes to a wire cooling rack to cool completely before adding filling or frosting. While the cakes are baking, prepare your coconut pecan filling. Mix the cornstarch into the cold coconut milk and whisk so that it’s well mixed in. Then add the vegan butter to a saucepan and let it melt before you add the brown sugar and coconut milk/cornstarch mix. 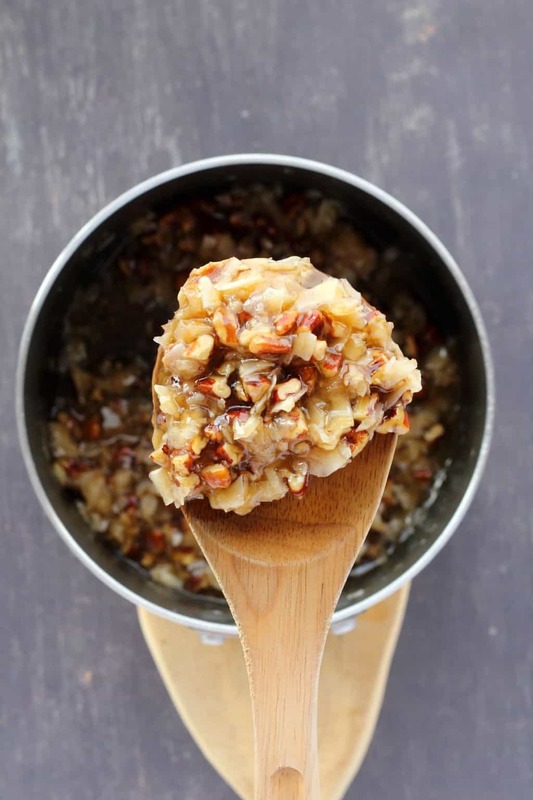 Stir constantly until the mixture boils and starts to thicken, then remove it from the heat and add in the vanilla, coconut flakes and chopped pecans. Set aside to cool completely before using. Prepare your chocolate buttercream frosting. Add the powdered sugar, cocoa powder, vegan butter, 3 Tbsp of coconut milk and vanilla extract to the bowl of an electric stand mixer. Start off at slow speed, gradually increasing speed until it’s very thick and smooth. If needed, add in around 1/2 tsp of extra coconut milk to get to the ideal consistency. I prefer to add this in last, only if needed, as you want this to be thick, but it still should be spreadable. If it’s still too thick, add in more coconut milk a drop at a time until you get the right consistency. When the cakes are completely cool and your coconut/pecan filling is completely cold, then you can finalize your cake. Add all the coconut/pecan filling to the middle layer and then all the chocolate buttercream to the top. 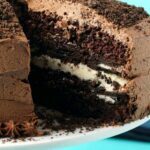 If you want to frost the sides as well you can do that, there is enough frosting to allow for this. 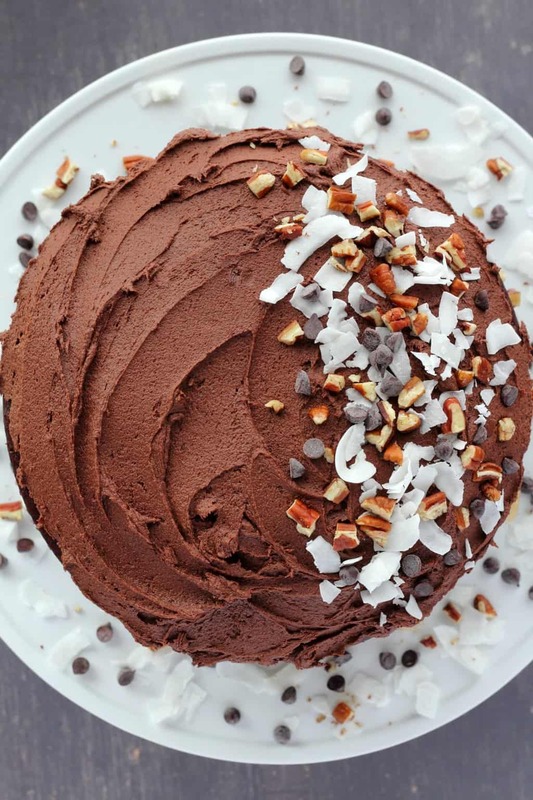 Decorate the cake with coconut flakes, chopped pecans and vegan chocolate chips (optional). *You can switch the soy milk in the cake for another non-dairy milk like almond milk if you prefer. *I like using extra virgin olive oil in my baking, but if you prefer you can use a different vegetable oil. 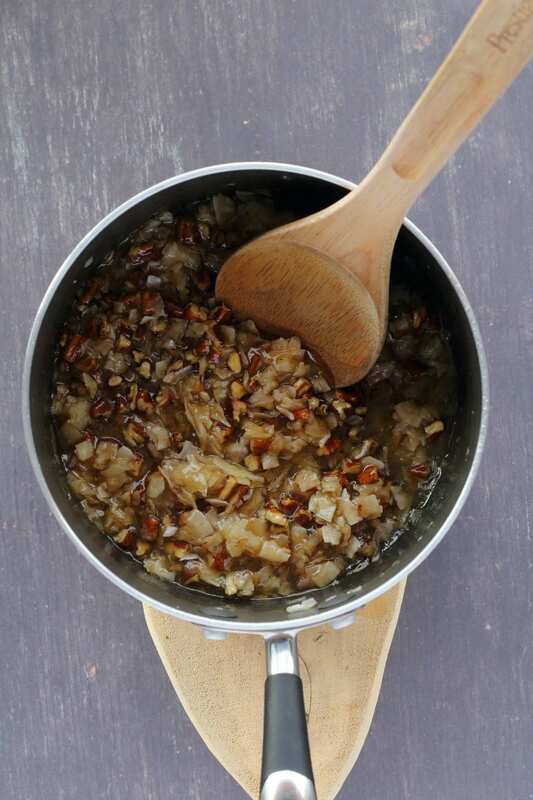 *White vinegar is interchangeable with apple cider vinegar in this recipe. *Coconut Flakes or Shredded Coconut are basically the same thing, but shredded coconut pieces are generally smaller, but you can use either/or. *Pecans can be raw or roasted. *I used coconut milk in the frosting as I already had a can of coconut milk open for use in the coconut/pecan filling. 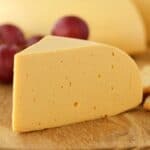 However, if you want to use a different non-dairy milk such as soy or almond, you can also do that. Wow! 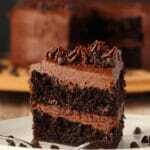 A super rich, moist excellent cake! Suitable for any festive occasion. Wow it looks amazing and yummy ! Do I use unsweetened coconut flakes or sweetened? Hi! This recipe was posted on facebook by a vegan site. And I’m drooling – in part because I’ve looked at 10 more recipes. 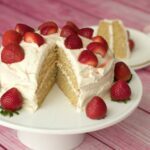 I have a question: Would your cakes work with gluten-free flour? 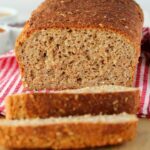 I know you have a gf chocolate cake recipe, but I’m wondering if you (or anyone you know) has tried making your other cakes and muffins with gluten free flour. I’m going to make this, for sure, next family birthday. Unfortunately I may have to sub the filling for something nut free as a family member doesn’t tolerate nuts well. But I’m sure The cake will be good even with a different filling! 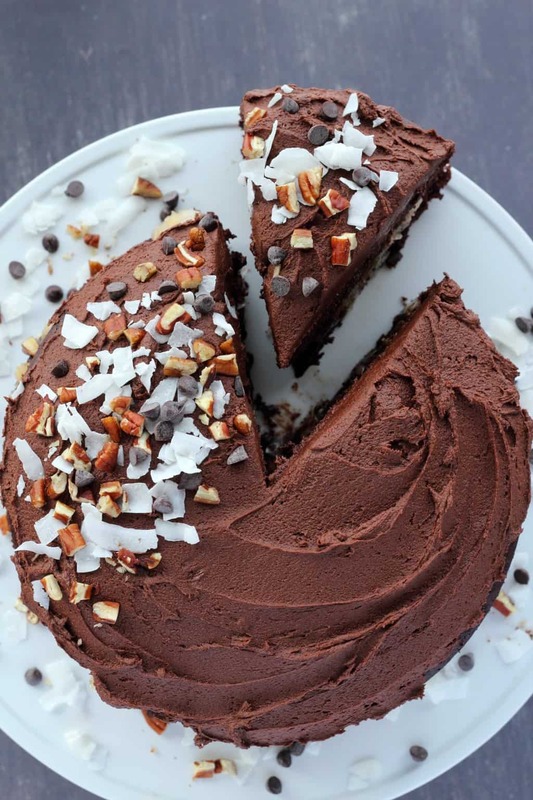 I love its total lusciousness – if you’re eating cake it might as well be the full deal! Your recipes never disappoint! I made this last night and it was another winner. The coconut pecan filling is amazing. I could have eaten all of it, just by itself! Thank you so much for all your work on these recipes and the easy instructions. I cannot believe I made such an amazing and delicious cake! Thank you!! You need your own cooking show! This cake looks amazing! I love the idea of the filling. I will be making a birthday cake for a friend and I would like to use this filling. However, he avoids palm oil and the vegan butter I can find around my area all contains palm oil. Do you think I could substitute coconut oil for the the vegan butter? I made this for my daughters birthday, it was absolutely delicious! Rave review from everyone! Can’t wait to make the coconut cake for my husbands birthday next month! I made this cake for my partner’s birthday. Everyone loved it. One of the guests said “if I hadn’t said it was vegan they would have never known”. Thanks for the recipe! I don’t have circular pans so I’m thinking of trying it in a square (9X9) or rectangle (33X22) and just making one layer with the filling on top and frosting on the sides. Do you know if either of these pan sizes will work ok? I don’t bake often at all so I don’t want to go buy 2 new pan. Thanks! Hi Nikki, it sounds like your rectangular pan is a quarter sheet size. You could use our chocolate sheet cake recipe and then just add this pecan filling to the middle and maybe frosting around the edges. I would just bake it a few minutes longer than directed because you’re using a quarter sheet pan rather than a half sheet. All the best! Wow, Alison, this recipe was a hit with my family! Mom always made the old Baker’s German Chocolate cake recipe, but I became allergic to milk protein. Also, I can no longer find the baking chocolate bar that she used. To surprise my brother for his birthday, I followed your recipe but with two variations. I used unsweetened applesauce instead of the flax eggs, and I doubled the filling to use half on top instead of the buttercream frosting. Not only did my brother enjoy the cake, but his wife, who only eats vegan foods, also loved it. 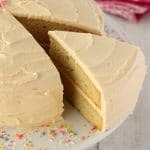 With the use of soy milk, I, too, was able to enjoy a delicious cake that brought back fond memories of mom’s cake from 50 years ago! Thanks for sharing this yummy and easy recipe. I made this cake. 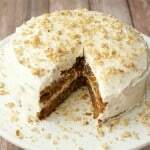 This recipe was awesome.I added pecan filling on the side as well. 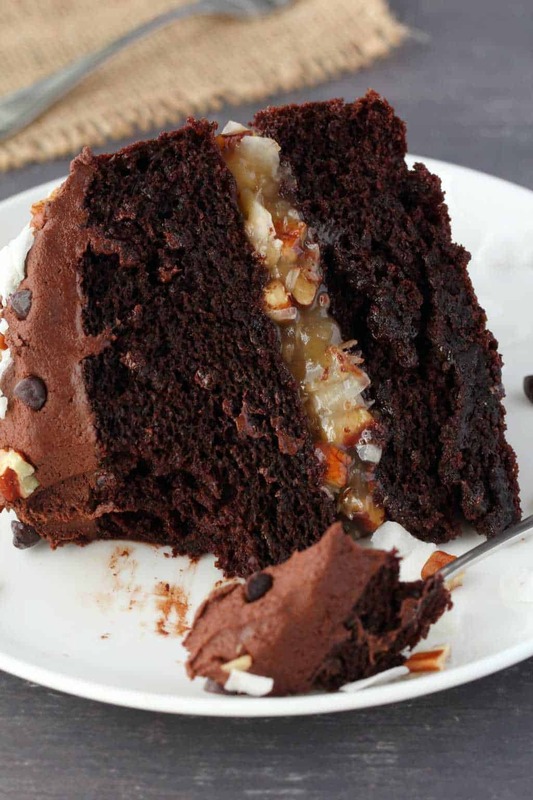 I used to make the best non vegan german chocolate cake. I could not tell any difference in the taste. I will definitely make this one again. Wow. 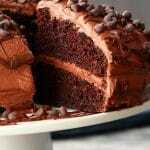 Just made the cake. I actually made it into cupcakes and I will make the pecan icing tomorrow. But I cannot believe how these rose, and how delicious they are. I mean really good! It’s my first time making a cake since being plant based and I was a little nervous with the texture of the raw batter. But wow! it’s just perfect! I subbed unsweetened almond milk for the coconut milk, and raw cane sugar for the white sugar because these are what I had. I cannot wait for the icing! Thank you!!! I made this for my husbands birthday. It was soooo good I almost forgot the cake was for him. Lol. It was moist and super decadent. Thanks so much for sharing this receipe. Haha, that’s awesome! Thanks so much for the great review Judy.